It's the heavyweight real estate duel of the season. Two of the city's most powerful men are battling to the finish in a highly charged competition wrapped in cash, influence and high-level politics. The victor's prize is the right to develop a choice piece of public Hudson River waterfront: the 470,000 square feet available at Pier 57 at 15th St. In one corner is patrician Roland Betts, CEO of Chelsea Piers - and pal and former Yale frat brother of President Bush. Betts is a scion of a monied family with close ties to Mayor Bloomberg's administration as well. He was a principal owner of the Texas Rangers baseball team, whose partners included Bush, before the team was sold at a tremendous profit six years ago. Betts, a financier, also has raised more than $1 billion to finance Hollywood movies that paid off handsomely, and in 1994 founded the sports and entertainment complex that takes up four piers running north from 16th St. In the other corner: upstart Steven Witkoff, who parlayed investments in a few tenements in his native Bronx into a massive real estate portfolio. One of Witkoff's deals, buying the 29-story building at 100 Wall St., netted him and his partners a cool $21 million when he sold it five months later in 1998. Witkoff knows Gov. Pataki well and is friendly with Charles Gargano, the Pataki-appointed state economic development czar. Witkoff and Betts have a few things in common. Both are lawyers and devoted family men with children. Both have given money and time to charity. Both also have street credibility. Witkoff knows construction and plumbing first-hand. Betts taught public school in Harlem for seven years after finishing graduate school. And both are scarred veterans of real estate battles who usually get what they want. The judges of Betts vs. Witkoff are the 13 board members of the Hudson River Park Trust, the government agency managing Pier 57 and the riverfront from the bottom of Manhattan to 59th St.
Five of the board members are appointed by the mayor, five by the governor and three by the Manhattan borough president. They include Lehman Brothers managing director Theodore Roosevelt 4th, Deputy Mayor Daniel Doctoroff, state Parks Commissioner Bernadette Castro and city Parks Commissioner Adrian Benepe. "We'll decide on what's best for the park, what's best for the community and which will generate the most income," said Charles Dorkey, an attorney Pataki made chairman of the trust. How much revenue the competing plans would produce for the trust and Hudson River Park is a major concern of the board, said Dorkey. Betts' proposal would pay rent that rises from $300,000 in the first year to $1.5 million in the fifth. The Witkoff proposal would pay $1.5 million the first year, going up to $2 million in the sixth. But the relative benefits to the community and the accessibility of the facilities are also concerns, said Dorkey. Publicly, elected officials have taken no position on the plans. Behind the scenes, however, the battle is raging - with both sides campaigning hard for the critical votes, belittling each other's proposals and using their considerable political leverage. For example, both Witkoff and Betts, as well as other officers of Chelsea Piers, have made significant contributions to Pataki's political campaigns. Witkoff has contributed more than $100,000, according to records and interviews, while Betts and other Chelsea Piers officers have given more than $27,000. Both Witkoff and Betts declined to be interviewed, citing a confidentiality agreement with the trust. But top sources in the competing camps agreed to talk to the Daily News, outlining their proposals while pounding away at each other. Witkoff's plan, called Leonardo at Pier 57, features a two-story pedestrian street with Italian shops, crafts stores and art galleries and a museum dedicated to Leonardo da Vinci. There's also a marina and a 46,000-square-foot rooftop park with a swimming pool. The big money-making part of Witkoff's design, however, is downstairs: nearly 100,000 square feet of ballrooms, banquet facilities and terraces, the largest such event space in the city. It would be run by Giuseppe Cipriani, the restaurateur and reigning king of the city's banquet business. Cipriani has a 20% piece of Witkoff's proposed project. The Betts proposal emphasizes sports, including a 30,000-square-foot aquatics center. There would be nine tennis courts on the roof. The second-floor plan features a dance center and seafood restaurant, while the first floor is focused on an historic-ships education center and a marina. "You look at the Witkoff plan, the Cipriani banquets will have 3,000 people showing up ... so that area of the West Side will be a gigantic parking lot," said the Chelsea Piers source. "Face it - all they want to do is make a ton of money from the banquet business. What good does that do the community?" he said. Pier 57 is only a block south of Chelsea Piers, which has its own lucrative banquet business. The Witkoff group source fired back that traffic would cause no problems for the community or the narrow strip of the West Side Highway in the area. "How many times a year do you think we'll have 3,000 people at a banquet?" said the Witkoff proponent. "We've got studies showing there's a big need for banquet facilities. "Anyway, why should Chelsea Piers be afraid of a little competition? Isn't this America? "We're going to have free photographic and art projects, we'll have a free museum on Leonardo da Vinci and the Italian government is going to lend us one of his paintings," the Witkoff source added. The Betts source fired back: "Kids and families are interested in sports, not in galleries, and besides, I don't think they'll ever be able to pay the rent they're promising the trust. "Their figures are pie in the sky. Ours are real, because we've already done it at Chelsea Piers." Proponents of the Betts plan have charged that Cipriani is connected to organized crime. Last year a government witness in the trial of Peter Gotti testified that Cipriani paid the mob $120,000 to keep unions out of his Rainbow Room restaurant at Rockefeller Center. "That's a bunch of crap. I don't know any of those [Gotti] guys," Cipriani told The News. "Never happened." Witkoff seems to have a slight edge in the battle. Community Planning Board 2, which is advising the trust, is backing his plan - "very conditionally because of the traffic problems that still have to be resolved," said Ed Kirkland, a member of the board. But Betts should not be counted out. Key items IN Pier 57 development plan: Italian crafts; retail; cultural center; marina; 87,000-square-foot ballroom/banquet facility; restaurant; 46,000-square-foot rooftop park. Business: Successful film financier, partner in the Texas Rangers baseball team, owner of Chelsea Piers. Committees: U.S. Olympic Committee, Lower Manhattan Development Corp. Previous financial backers: Morgan Stanley & Co. Political contributions: Gov. Pataki and state legislators. Key items IN Pier 57 development plan: Art galleries; dance center; 30,000-square-foot pool and aquatic center; rooftop tennis center with nine courts; marina; restaurants; other commercial space. Anyone know what happened behind closed doors ? West St. at W. Houston St. Please take note that the only item on the Agenda will be an Executive Session to discuss the Pier 57 Proposals. The Executive Session will not be open to the public. An artist's depiction of the joint proposal for the Leonardo at Pier 57. It would include the city's largest banquet hall, and a branch of the Leonardo da Vinci Museum in Milan that would feature Leonardo's work. After 18 months of review and a fierce battle between two rival bidders, a state park board has chosen a group led by Giuseppe Cipriani, scion of the family behind Harry's Bar in Venice, to transform a dilapidated 880-foot pier at 15th Street and the Hudson River into a development of museums, stores and cultural workshops with an Italian theme. 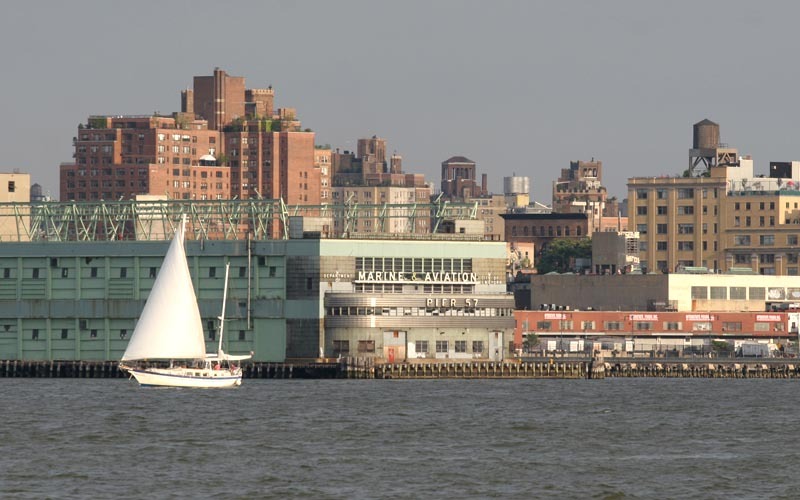 The board's decision infuriated the losing bidder, Chelsea Piers, whose president, Tom Bernstein, called it "a highly questionable use of the waterfront." The latest addition planned for the $154 million project, "The Leonardo at Pier 57," is a branch of the Leonardo da Vinci Museum in Milan that would feature a rotating exhibition of the artist's paintings, inventions and other works. But the project's largest element, and the one that drew the most criticism, is what would be the city's largest banquet hall. The Leonardo at Pier 57 still faces an environmental review and lease negotiations, but if the developers are successful, it will be the latest element in the development of a five-mile waterfront park along the Hudson River. The Hudson River Park Trust, which controls the pier and selected the development plan, hopes that it will generate enough rent to maintain and expand the park. "We've gone through a painstaking and transparent process to come up with a great new use for Pier 57," said Charles Dorkey, chairman of the park trust. "While many steps remain, we believe this will be a great addition to the waterfront." The project would also include a one-acre rooftop park, art galleries, a marina and a branch of the Triennale di Milano design museum. Mr. Cipriani, who operates the Rainbow Room, would operate the banquet hall and event space. His partners are Steven C. Witkoff, a developer, and Plaza Construction. But Mr. Bernstein said that the Leonardo's banquet hall would cause enormous traffic problems and compete with similar event spaces at Chelsea Piers, the sports complex three blocks north of Pier 57. "It's hard to believe that putting in the city's largest banquet hall is the best use of the waterfront," he said. "The parking and traffic problems are still unresolved." Mr. Dorkey said that the board felt that Cipriani-Witkoff proposal offered more public space, a better design, new cultural attractions and a better economic deal for the park. In its losing bid, Chelsea Piers had proposed a family swimming center and a marina, with space for art galleries and studios. Personally, I was expecting Chelsea Piers to win, so this is good. Their criticism, however biased, was expected. I like the plan, I think it's pretty original and should be a success. I do think, though, that Chelsea should have won Pier 57 and this should be on another pier or made part of Pier 40. I would love to see this completed, though...soon. Chelsea Piers came up with an uninteresting (why tennis courts?) and unresponsive proposal (read the original RFP about respecting the history of the site and not increasing the height) believing only that their money and contacts would prevail. What they did do was to hog a finalist slot thereby eliminating the community-originated proposals which both needed to be "massaged" by the TRUST to solidify the financial underpinnings. Leonardo's was started by James Ortenzio (former HRPT Board Chair and that's his Henry Stern parkname) and championed throughout the process by him to stop Chelsea Piers. By the end, they had absorbed (taken? stolen?) many of the good (read original) ideas and people from the community-originated proposals. Why celebrate Italy (read the original RFP) ? How do you justify a $154 mil project on a limited footprint with a finite income stream (the community proposals were told that they couldn't generate enough for a $120 mil project) ? All of the complaints about traffic seemed justified (it might take a few hours...do the math... to get your car out of the elevator from the stacked parking in the basement)...warehousing cars on the waterfront really would interact badly with the existing activities at Chelsea Piers. The TRUST is controlled by the Governor. The staff seemed earnest, but the process was/is so political that Dorkey (Ortenzio's successor) immediately went on the defensive in the Times article backtracking to defend the decision-making process. Chelsea Piers will sue the TRUST... Leonardo's has "over-promised" what can be financed and operated successfully. It's not over yet. Yeah, that roof park sounds very nice - public access like that is what Chelsea Piers doesn't have. Based on the finalists, they picked the right one. Chelsea piers is not a friendly place to visit unless you're a member or attending a function there. Private facilities of public parkland should be absolutely minimized. Pier 57 in August 2005. No movement on this yet, huh? While HRP is wonderful and will be amazing when completed, the lack of progress on 57 and 40 is disappointing to say the least. These are major attractions for the park, and revenue generators. They need to be built. According to the HRPT RFP for Pier 57, after the award was made to the Witcoff/Cipriani Group, they had a small window to do their due diligence (30 days?) then they had to put up a deposit and submit their final plans for approval by the various layers of bureaucracy. The time for all of this has long since passed without any word from the park planners. Chelsea Piers will probably sue because of the impossible traffic plan which would add another year to the process. Welcome to waterfront politics ! The new project going up on the Hudson River is the "Leonardo on pier 57" which I think will be a very popular (year round) attraction. However, one of the feasibility issues for the new development was how to transport many people and/or vehicles accross the six lane hhparkway. Somewhere (perhaps on wired) I saw a new item showing a proposed link between the "High Line" and "Leonardo on pier 57". I think that is a great idea. Any info out there about the high line connection. ^ What's so bad about waiting for the red light and walking across the cross-walk? In the wake of a recent recommendation by a community working group about the redevelopment of Pier 57, the two rivals for the project have commissioned competing traffic studies in the hope of influencing a decision expected soon by the Hudson River Park Trust. ... The Working Group voted in favor of Leonardo on Pier 57 recently. And soon after, Chelsea Piers commissioned Schwartz to do a traffic study. Schwartz found that the Leonardo project would cause unprecedented congestion on the West Side Highway, have a negative impact on the Hudson River Park bikeway and walkway and make it harder to get in and out of the sports and entertainment complex, which Chelsea Piers developed and has been operating on Piers 59, 60, 61 and 62 for the past 11 years. I saw a new item showing a proposed link between the "High Line" and "Leonardo on pier 57". I think that is a great idea. I think that could be really problematic (using the High Line as an access point to a commercial area that is described as very high volume). Part of the glory of the High Line is that it is removed from the city. Of course the development of the park will change what it is now, but the High Line should not be allowed to become a "short cut" across the West Side Hiway.